Having a responsive website is no longer just a feature; it is a necessity the lack of which will literally impact the growth of your business. Responsive web design (RWD) offers the only way forward in a world that is in a continuously evolving. Future projections show an ever increasing number of devices will be used to access the internet - ranging from small scale gadgets such as watches, glasses, etc. to large TV displays - making a responsive design a standard for the foreseeable future. 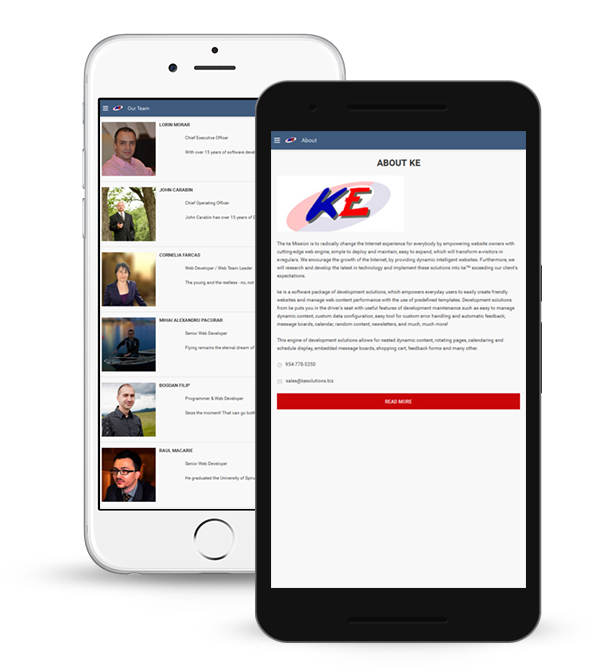 ke Solutions understands the behavior of today’s customers and delivers engaging responsive web designs across multiple platforms. Maximized performance responsive web design allows one website to provide a great user-experience across many devices and screen sizes, and it also makes managing the SEO strategy easier. Are you curious about the way things will develop in the future? We certainly are! Therefore we stay up to date on everything that impacts web development, web design, search engine optimization and innovative online marketing. Responsive design is not the future, but is already the norm! Choose Responsive Web Design that works magic and generates business!